Protecting, housing and educating is a common mission for all nature centers in Wisconsin. From restoring marshland and prairie grass, to being able to closely observe our most prized natural spaces—Wisconsinites can take solace that we have so many great nature preserves. Here are the top 10 best nature centers in Wisconsin. Become one with the wilderness at the Aldo Leopold Nature Center and its 38 acres. Visitors are encouraged to take part in their seasonal events and overnight adventures. Visitors of all ages can find something to peak their interest. A small admission fee is asked for visitors to visit the nature of the Northwoods in Cable, Wisconsin. There are many different programs and actives for all ages put on throughout the year. Guided kayak trips and bird watching are among of their most favored educations programs. Olbrich Botanical Gardens is a Madison treasure. Visit the tropics that are filled with exotic plants, birds, and waterfalls. Otherwise stay close to home by touring their 16 acres of Midwestern plants and animals. 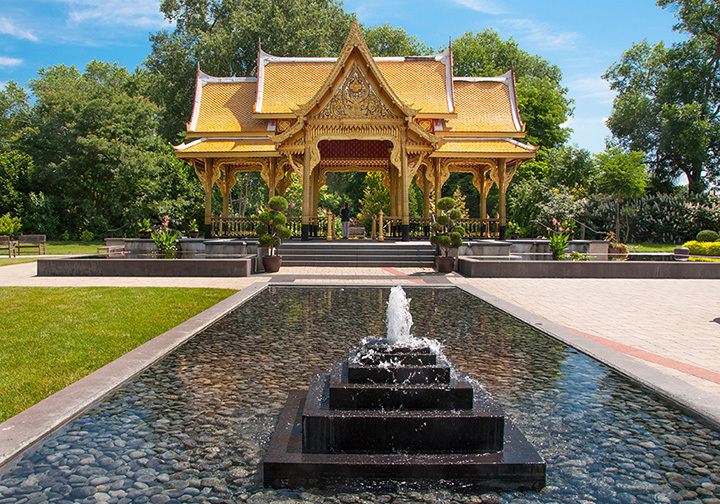 Olbrich Gardens is a gardener’s dream. Become hands on at MacKenzie Center with their informative exhibits, trails, and collections. Youth groups and school field trips often make a pit stop at MacKenzie Center for fun, educational purposes. With 500 acres to base their adventures off, why not make it a day trip if you haven’t yet? The Arboretum offers many programs to educate the public about living with nature and nurturing what we have left. Free walks and tours are available as well paid privately guided tours of their many different sites. For 45 years the Gordon Bubolz Nature Preserve has been educating the Fox Valley area. Special events like cross country skiing, birds and beaks, insects, and snowshoeing are held in their Appleton location. Features of the preserve include over 725 acres of ponds, hiking trails, benches, picnic tables, and seasonal winter trails. Located on beautiful Lake Michigan, Schlitz Audubon Nature Center is 185 acres in size. Pilled with hiking trails and a 60-foot observation tower—this nature center is one for the books. Summer camps, adult programs, after school programs, scouting programs, and Master Naturalist Courses are available at the Nature Center. There are a vast number of habitats in the Hunt Hill Nature Center. These 500 acres include old forested areas, meadows, and glacial lakes. Visit for the day and take a hike on their 10 miles’ worth of trails or take the kids to their Youth Day Camps. If you’re really looking to connect with nature Hunt Hill offers historic cabins for weekend getaways. The Urban Ecology Center is conveniently located in one of Wisconsin’s largest cities—Milwaukee. The ecology center has grown to two locations serving over 77,000 people, their mission being to restore urban green spaces in the Milwaukee area. Come see upland forest, wetlands, prairie, oak savanna remnants at the Pringle Nature Center located in the Bristol Woods County Park. The nature center stays busy hosting many different activities throughout the year. Bird watching, snow showing, wild life observations, hiking, and other education programs are led by highly educated instructors. View more Wisconsin Nature Centers and Botanical Gardens.